The following review of Tarapoto’s Hotel Cumbaza was originally left as a comment on TarapotoLife by a visitor to Tarapoto named Sabina. The comment was so informative that, with Sabina’s permission, I decided to turn it into a blog post. Thanks Sabina! I went to Tarapoto on some personal business for what I thought would be a week. It was arranged that I stay in Hotel Cumbaza which is a 3 star hotel on one of the main streets in Tarapoto. Being on a main street is not a plus in Tarapoto. The main mode of transport is by mototaxi – an unmufflered mototaxi. However, the hotel does have rooms that do not face the street and these rooms are quiet. Another reason not to be on the street is the rain. I was doing the Sunday NY Times crossword puzzle online on my bed. The rain was very heavy on the window. I stepped out of bed into some water and was puzzled. The bed was dry. The ceiling did not appear to be dripping, but there were puddles on the floor. Looking around, I saw water dripping down the wall. The window and the air-conditioner were not well sealed so the beating rain made its way inside. I called downstairs for someone to come, but no one came. I do not speak much Spanish so perhaps they did not understand me. I went downstairs to explain and someone came with a mop. He saw it was beyond a simple mopping. I changed rooms and that is when I discovered the advantages of an inside room. Since I was planning to stay for a week, I was able to negotiate the price down to 90 soles per night which included Wi-Fi, air-conditioning, hot-water (if you let it run for awhile), a refrigerator, transport to and from the airport and breakfast. The air-conditioner had a remote control that required standing in one particular spot and holding the remote control very high. Usually I left it off but, late one hot night, I wanted to turn it on. I did not notice the power was out and tried many positions before giving up and going back to sleep. The power goes out a lot in Tarapoto. It is good to have a battery-powered head lamp if you want to be able to see at night. Because breakfast was included I ate in the hotel every morning. There were a number of options so I decided to try each one. But as I went down the list, I found that some options were never available and some would be available “tomorrow” or “later.” I was reasonably happy with the breakfasts except for the day when there was no coffee. I found a nice coffee shop on the main plaza next to the supermarket. It was a little expensive for Peru, but it was clean and had Wi-Fi. The refrigerator in the room let me stock up on cold drinks and snacks from the supermarket. I also found a laundry, Lavanderia Ecoclean, in the 400 block of Augusto B. Leguia that provided same day service for 6 soles per kilo (about $1 per pound). My favorite restaurant, La Collpa, has a nice view of the river valley and prepares fish quite well. When it became necessary to stay more than a week, I looked at several other places to stay, but decided to remain at Hotel Cumbaza. The staff was reasonable. The rooms were clean, reasonably sized and well ventilated. I think the 3 stars are for the amenities which worked for the most part. Thanks again Sabina, very informative. 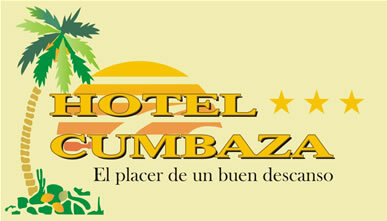 Have a look at the Hotel Cumbaza website for more information (Spanish only, but there are some photos! ).